Sheffield United will host West Bromwich Albion in SkyBet Championship action this Friday night. Both teams are currently occupying play-off positions, with just one point separating the hosts in 3rdand the visitors in 5th. This match sees the league’s highest scorers in West Broms attack come up against the fifth most prolific scorers. We could have a goal fest on our hands. Sheffield United at priced at 6/5 to win this match by SkyBet. They will be hoping to improve on recent form in front a home crowd as they have gone goalless in the last 180 minutes of football at Bramall Lane. Looking to provide the much-needed goals will be striker Billy Sharp. The Englishman has already bagged 11 goals this campaign, the fifth highest in the division. He is priced at 5/4 to score anytime. The Blades free flowing fluid style of play has been praised by many. However, it has led to some disappointing defensive displays. They have managed just three clean sheets in their last 10 matches. They also face the league’s highest scorers, so it looks unlikely that Dean Henderson will be kept quiet on Friday. Sheffield United to win and both teams to score has been price boosted to 10/3. West Brom are priced at 21/10 to win by SkyBet. The Baggies have turned their bleak form around last month and have gone five matches unbeaten. Their last two encounters have seen home draws against Brentford and Aston Villa. They will need three points if they are to keep up with the pack at the top. Scoring has not been a problem for Darren Moore’s side with Jay Rodriguez, Dwight Gayle and Harvey Barnes sharing 28 goals between them. Both Gayle and Rodriguez are on 10 goals a piece and share a price of 5/1 to score first. If West Brom were able to show more dominant defensive displays, they would easily be in the top two. They have just one clean sheet all season. Added to this, their last five matches have seen both teams find the net. SkyBet have price boosted West Brom to win and both teams to score to a whopping 5/1. Worth a punt. The referee for this match will be Jeremy Simpson. The official has averaged 40.7 booking points in his 14 Championship matches. 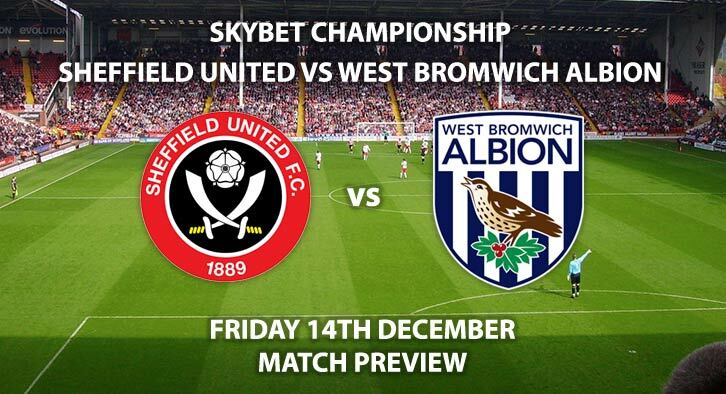 Sheffield United vs West Bromwich Albion will be televised on Sky Sports Football HD and kicks off at 19:45. This match could go either way, however the visitors have more attacking firepower. West Brom Price Boost – BTTS and West Brom Win – 11/2. RequestABet Specials up to 10/1 – Over 1.5 Goals, Sharp & Rodrigues 1+ Shot on Target each, 10+ match corners and 10+ booking points each team – 10/3. RequestABet Specials up to 10/1 – BTTS, 4+ corners each team and 20+ booking points each team – 13/2. Both Players to score – Billy Sharp and Dwight Gayle both to score – 9/2. Scorecast Boost – Mark Duffy to score first and Sheffield Utd to win 2-1 – 100/1. Odds and markets last updated on Friday 14th December @19:13 GMT.